Walmart (WMT.N) sells more blue jeans than anyone, but its in-store employees couldn’t wear them while on the clock -- until now. The nation’s biggest private employer is testing new dress codes in a small number of U.S. stores, hoping that more relaxed standards could help it attract and retain staff in a tight labor market. 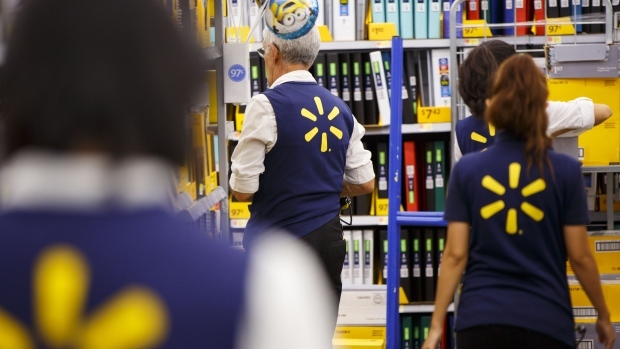 Employees in some of Walmart Inc.’s 4,700 stores will now be allowed to wear shirts of any solid color, rather than just blue or white, according to an employee manual obtained by Bloomberg News. Blue jeans are also permitted -- as long as they’re solid blue -- whereas previously only khaki-colored or black denim pants were allowed. Visible facial tattoos are forbidden for those hired after April 14, the manual said. The proposed changes are the latest employee-friendly step Walmart has taken in recent months as its battles other retailers to recruit and retain cashiers and shelf stockers. In February, it boosted its starting hourly wage and doled out bonuses to employees. It has also expanded its parental-leave policy and added an adoption benefit. The moves come as the nation’s unemployment rate has plummeted to 4.1 per cent from 5.7 per cent in 2015. Walmart is trying out several different new dress rules across various stores at the moment, and they might not lead to anything permanent, the company said. Walmart has altered its dress code before, most recently in 2015, when it allowed U.S. employees to wear black or khaki-colored denim pants and let those with more physical jobs, like cart pushers and garden-center staff, wear t-shirts rather than collared shirts. But some things haven’t changed from the days of founder Sam Walton -- all clothing should be wrinkle-free and in good condition, and beards must be neatly trimmed.